“So, you wanna buy a nice Collector’s Edition? I can get it for you retail. Thanks, I’m here all week. The veal is on special. Now imagine you can get him to personally conceive and oversee the production of the coolest statue in the world. —A 3-inch baby version keychain of the sold-out Murder of Crows vigor bottle replica. —A 5 x 7-inch lithograph by Jorge Lacera. 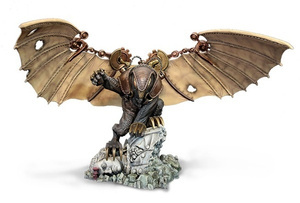 —A 25 millimeter, resin-cast Handyman miniature from the upcoming BioShock Infinite board game by Plaid Hat Games, makers of Summoner Wars. 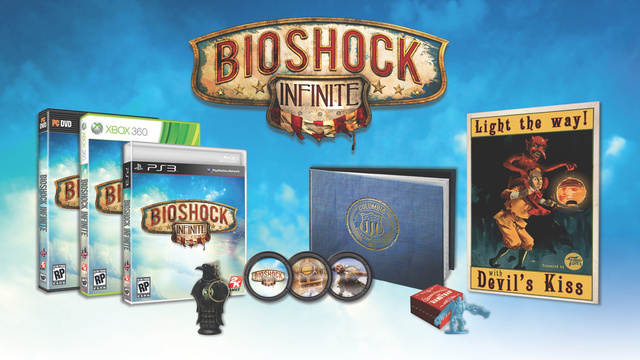 —A mini art book, full of BioShock Infinite concept art and commentary, with a hand-distressed cover. —Various digital goodies: exclusive in-game gear, a digital soundtrack, and platform specific downloadable content (Avatars for Xbox LIVE, and Themes for PC and PlayStation 3). Of course, all of the above is also included in the Ultimate Songbird Edition. And for the true nerds in the audience, the Songbird statue, the Murder of Crows keychain, and the Handyman all come in separate custom packaging. Both Collector’s Editions will be available in limited quantities, so yadda yadda, sign your life away right now! Anybody going to grab either version? Let us know!